← Farewell to the Solway Spaceman? “….Reports that a 150ft squid-fishing boat ripped from its moorings in the Japanese port of Hachinohe by last year’s tsunami has been spotted drifting, rusty and abandoned, off the west coast of Canada – more than 4,700 miles away – saw news media around the world reach unhesitantly for the words ‘Mary Celeste’. 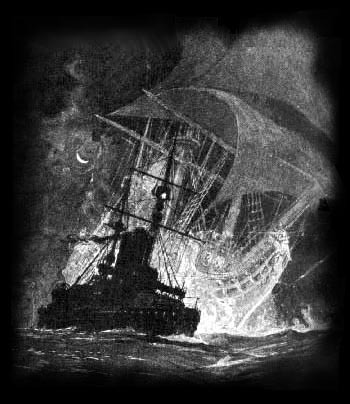 “In fact, the Flying Dutchman is the original ghost ship, doomed never to make port and sail the seas forever. But despite being celebrated in verse and prose since the 1700s, as well as inspiring a Wagner opera and the Pirates of the Caribbean, she was only ever a legend. “The brigantine Mary Celeste really was found abandoned, heading for the straight of Gibraltar in 1872. She was missing her crew but otherwise intact, carrying six months of supplies and still, remarkably, under sail. The last entry in the ship’s log was written 11 days prior to her discovery. “More recently, in 2006, coastguards investigating the case of the schooner Bel Amica, discovered drifting off the coast of Sardinia, found half-eaten Egyptian meals, French maps of North African seas and a flag of Luxembourg – but not a living soul on board. 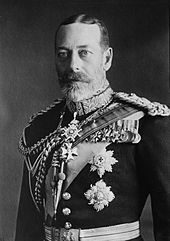 One of the best known sightings of the legendary ‘Flying Dutchman’, referred to in Henley’s article, was made by a very credible witness: Prince George, who was later to become King George V, the grandfather of the present Queen. Strange things do happen at sea, folks…. This entry was posted in Uncategorized and tagged Bel Amica, Bermuda Triangle, Flying Dutchman, G2, ghosts, HMS Bacchante, HMS Inconstant, Jon Henley, King George V, Mary Celeste, nautical folklore, Peter Haining, phantom ships, Pirates of the Caribbean, Prince George, Tai Ching, The Guardian, The National Archives. Bookmark the permalink.